X Japan leader Yoshiki vows to never give up fight to crack U.S.
Yoshiki, composer, songwriter, and leader and drummer of X Japan, said Thursday he will never stop trying to crack the American market, a mission he described as a "responsibility" to the late members of his mega rock band. 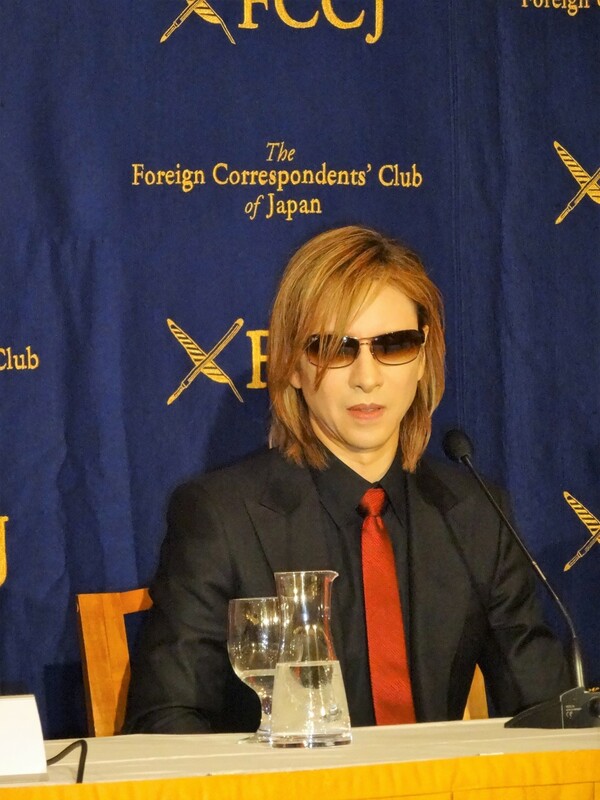 Speaking at the Foreign Correspondents' Club of Japan in Tokyo, having only just completed X Japan's first studio album in 21 years, Yoshiki's voice cracked with emotion as he spoke about his unfulfilled dreams after residing in the United States for more than two decades. "I moved to America 25 years ago, and I was going to come back to Japan if I thought I am good enough or I can make it here (in the United States). I don't think I have made it in the American market yet and still think I am relatively unknown, but I am still trying." "When do you stop fighting?" he continued. "I don't have an answer. But I think moving forward and keeping on fighting is part of your life. When you stop, that is the time that you die." Asked about the retirement of legendary Japanese music producer Tetsuya Komuro earlier this year, Yoshiki said, "Being an artist you retire when you die, and I told him (Komuro) that too." Yoshiki's father committed suicide when he was 10 years old and his life with X Japan, who boast record sales of over 30 million in Japan and have fans all over the globe, has been marred by several traumatic experiences. Vocalist Toshi left the band at the end of 1997 after coming under the influence of a cult called Home of Heart, but later rejoined the band. In 1998, guitarist Hide hung himself, while another former member Taiji, who left the band in 1992, died in 2011 of apparent suicide. "My members died. Making America was a part of the members' dream too so I have a responsibility." "We just have to keep on moving to the end. I want to contribute to change the map of the entertainment industry in the world," said the 52-year-old musician. X Japan broke up in 1997 but reunited 10 years later. Last year the band, which has sold out Tokyo Dome a record 18 times, released a revealing documentary "We Are X," a film that won critical acclaim and Yoshiki admitted had been hard to make. "It was the hardest thing I have ever done. X Japan's history is almost too crazy and too sad to be true. It was so hard to open the door to the past, because I lost my father and Hide and Taiji passed away and Toshi got brainwashed." "If somebody tried to write the script it would be too much, and I thought 'hell I cannot do that' and shut the door. But after several years of talking, people convinced me that our story may be able to help people's lives and inspire people that are suffering from depression or something. I thought that might be a good reason to revisit that project." Yoshiki, a classically trained pianist, was the first-ever artist to be awarded with the "Asian Icon Award" at the Classic Rock Awards. Away from X Japan he has composed pieces including a piano concerto to celebrate the 10th year of the reign of Japanese Emperor Akihito, and the official theme song for the 2012 Golden Globe Awards. His album "Yoshiki Classical" was co-produced by Beatles producer George Martin. X Japan play three upcoming dates, Sept. 28, 29 and 30, at Makuhari Messe in Chiba, near Tokyo, and Yoshiki will perform Yoshiki Classical with the Philharmonic Orchestra on Nov. 12 and 15 at Tokyo International Forum. X Japan's Yoshiki to undergo emergency neck surgery in U.S.
"This is probably our (X Japan's) first big show in eight years since we played at Nissan Stadium (in Yokohama). We will probably be playing to around a total of 100,000 people over three nights." The latest album has been roughly 10 years in the making. "I was recording the album right until the last minute, and was actually supposed to come back to Japan the day before yesterday," said Yoshiki, who arrived in Tokyo on the same flight as Japan's newly crowned U.S. Open tennis women's singles champion Naomi Osaka. "It's taken almost 10 years, so instead of thinking about a tour and all those things, I just wanted to concentrate on finishing the album. It is done now and I will talk to my agent and manager about what to do with it."